Shop for the Dog Lover in you or perhaps a Special Gift for a Special Dog Lover in your life with quality Dog Breed items that are sure to please. 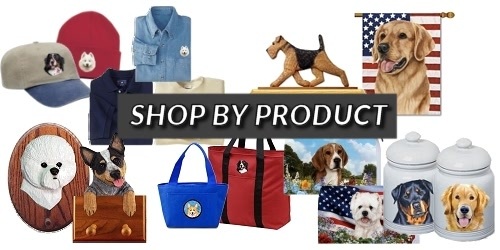 Much of the Dog Breed merchandise at DogShoppe.net is crafted in the United States and made when ordered – ensuring quality and uniqueness. Show everyone that your special Dog Breed is the absolute best with garden and house flags or garden stakes in your yard, clothing, signs and art in your home, accessories for your kitchen or car and holiday decorations. Unique Dog Breed gift items that are sure to thrill the most discriminating Dog Lover. Click on the dog breed products below to see beautiful products in all dog breeds !